The whole team at the Mercure Marne La Vallée Bussy St Georges wishes you a warm welcome to our beautiful region. Make the most of the city-center location in the heart of Marne-la-Vallée to visit Disneyland Paris or the center of Paris. 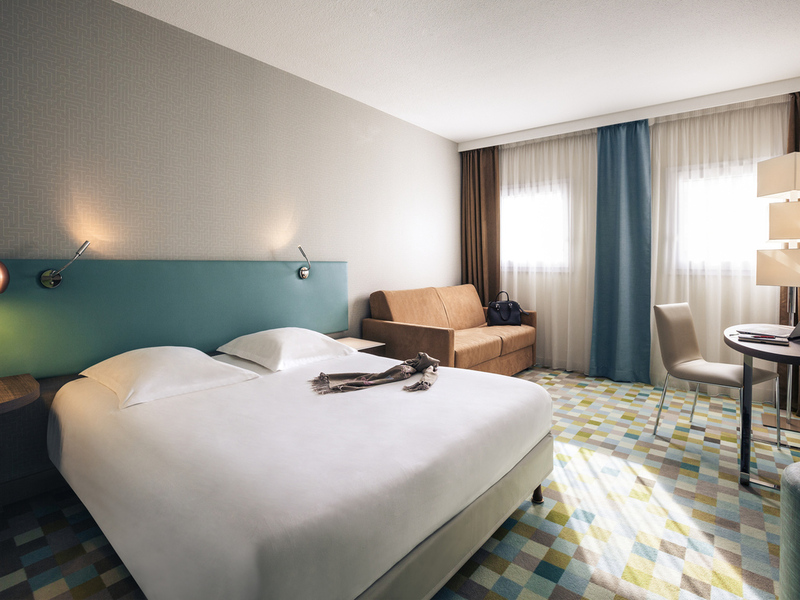 Located in the heart of the Val d'Europe business center, the Mercure Marne La Vallée Bussy St Georges hotel has been fully renovated with a modern and friendly atmosphere. The hotel has family rooms and a play area for children. Visit Disneyland® Paris, only 5 minutes away from the hotel by car. Our Le Puzzle restaurant welcomes you with its simple, quality cuisine. Enjoy our cocktails and fine wines in the quiet and comfortable setting of le Domino bar. The recently renovated, air-conditioned rooms have cable HD TV, a safe, high-speed Internet, fridge, and tea and coffee making facilities. Complementary beauty products are provided in the bathroom. Privilege Room - 1 double bed. Excellent restaurant serving traditional French cuisine with capacity for 70 people. American service, banquet events and hosting of family parties. Children's menu. Come and relax in "Le Domino" bar while sipping drinks and cocktails of your choice. Enjoy the calm atmosphere and relax with family, friends or colleagues.